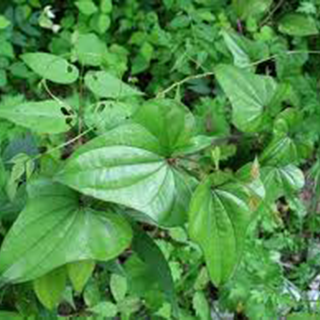 Perhaps best known as the herb that gave rise to the first oral contraceptive pill, wild yam is native to the southern and eastern US and central America, although it is now naturalised in many semi-tropical areas worldwide. The chemical from the yam, diosgenin, was identified in the 1930s, and by 1960 was being used to manufacture the hormone progesterone. Take 1/2–1 cup 3 times daily of a decoction made by simmering 1/4oz (10g) in 1 pint (600ml) of water for 20 minutes for colicky pains associated with IBS or diverticulosis. Drink 1/2 cup every 3–4 hours for period pains, or sip cups constantly during labor to relieve pain. Take 40–60 drops (2–3ml) 3 times daily for menopausal problems. Take 20–40 drops (1–2ml) in a little water 3 times daily for arthritis: usually combined with other herbs such as black cohosh, cramp bark, meadowsweet, or white willow for rheumatoid arthritis. Also useful to stimulate liver function. Prefers light to medium (sandy to loamy) soil that is moist but well drained, and requires partial shade. Usually grown from root cuttings, or from pea-sized tubers found growing in the leaf axils in late summer that can be collected and planted immediately. The plants are dioecious (have separate sexes), so both male and female plants are needed to set seeds, which can be sown in a cold frame in early spring and transplanted when large enough to handle. Dig tubers and roots in autumn, and wash and dry them.